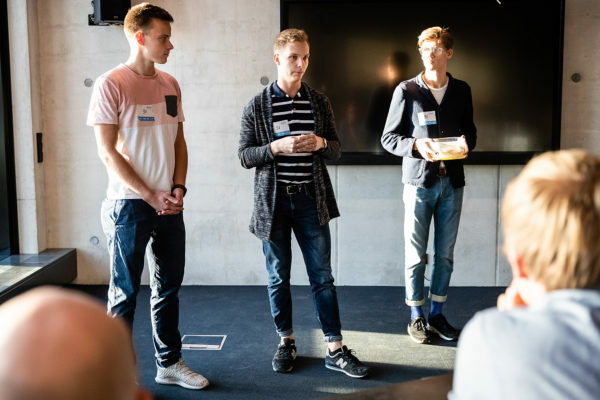 “By 2050, there will be more plastic in seas and oceans than fish,“ says Edible Team Leader Brett-Peter Rästas about the problem that Tartu upper secondary school seniors have been working on for more than a year. 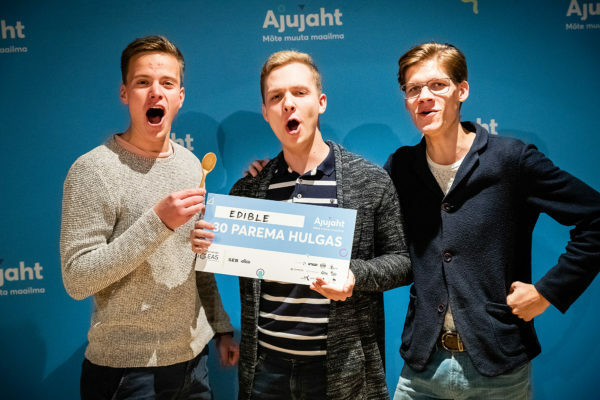 Brett leads a team called Edible, which made it to Ajujaht`s TOP 30 business ideas. They produce single-use edible spoons. 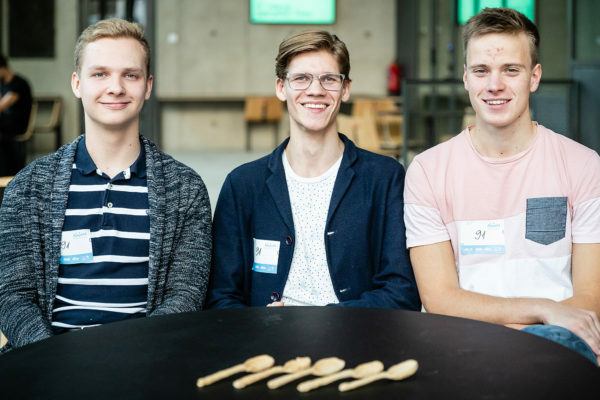 “Edible spoons are the most environmentally sustainable alternative to existing single- use cutlery,“ says Brett and adds that they are most concerned with conservation of the environment. The idea was born in 2017, when they had to start a student company at school. “We were researching what to do and came upon news that said that France wants to completely ban single-use plastic by 2020,“ told Brett. The saw an opportunity in the problem and started looking for a solution together. Though, there are a number of environmentally sustainable alternatives to plastic, Brett says that they don`t really tackle the problem very efficiently. Biodegradable plastic and wooden alternatives are not nature- friendly and still leave a trace. Edible spoons can be eaten after use. “We built Edible on the concept of edibility, because it is more innovative. But if you do not want to eat it, then it works like biodegradable plastic, only better,“ explains Brett. During product development, the boys carried out a test, they put the spoons under a hedge and they disappeared completely within a couple of weeks. It doesn`t matter whether it was an animal who ate them or they just decomposed. According to Brett, the important message is that no trace was left behind. Though the inspiration came from France, the boys didn`t take the challenge lightly. Product development came with thorough self-education and mapping the market, which helped set sights. Starting out as a student company, the team focused on direct sales to end customer. Scaling the business this way is quite complicated, so they decided to focus on the B2B business model. The team`s list of cooperation partners and interested parties already includes catering companies, resellers, food and organic shops, big events and festivals and other private companies. “Due to consumer pressure and different regulations, many companies will have to give up plastic over time,“ explains Brett. Currently, they are gearing up for their first serious pilot. The team has conducted many test groups to test the product. “About 90 per cent of 2000 people are willing to purchase and use our product,“ says Brett. He adds that they have given spoons to companies to try, but the first pilot project will take a little while longer, because it is still under planning. Making the first spoons was simple on the idea level. The boys bought as many different flours as possible to start experimenting. They made the first spoons in their home kitchens. “We started in each other`s homes and quickly realised that this is not the way forward. We lacked knowledge and resources,“ says Brett about the initial experimentation. A few months later, they reached an agreement with Tartu Vocational Education Centre, where they later moved their production to. Currently, the production and product development take place in the University of Life Sciences food lab and a person with an education in food technology has joined the team. 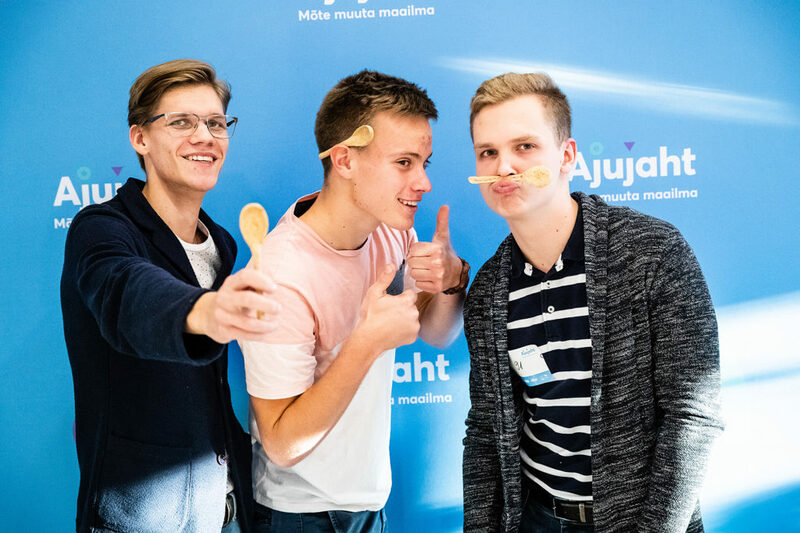 Three team members out of four are about to finish upper secondary school this summer, so they are working actively on their future plans, where the priority is developing Edible and taking it to big markets. Plan A is raising funding to scale up production volumes. The impact of plastic products on the water environment especially is incomprehensibly big and the fact is that we cannot continue like this. And for that very reason, there is no doubt that Edible is on the right track.